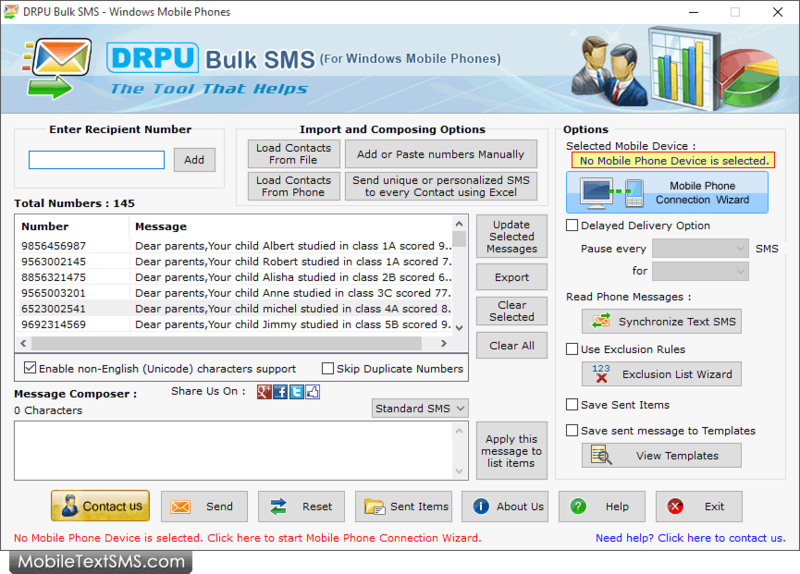 Bulk SMS for windows mobile software compose and send sms from PC to group of mobile phone users using major Windows based Pocket PC/PDA mobile phone connected to your computer. Windows mobile messaging program send sms windows messages in bulk numbers without any special assistance. bulk text message windows mobile software helps to reach the larger audience and provides inexpensive way for product marketing or alert process. Windows mobile text message program with use of powerful windows sms tool compose and send windows mobile text messages including Alert sms, Invitation sms, Campaign sms, Product promotional sms, Marketing sms and other similar type of sms in best possible manner. PC to mobile sms marketing software is useful to send job alerts, product promotion and event notifications globally to bulk of contact numbers via Desktop and Laptop PC. Bulk sms Microsoft Windows program load Contacts from File, Phone memory or Send unique or personalized SMS to every Contact saved in Excel file format. Exclusion list Wizard option maintains the Lists of contacts or Groups, which you may need to exclude time to time when sending messages. Bulk sms provider provides option to save sent messages in txt, html, xls file format. Bulk windows send sms program facility to send SMS using Delayed Delivery Options to control the load of sms. Send windows mobile messages that contain non-English characters. Option to save sent message to templates while send sms from windows based mobile device. SMS messages windows mobile program does not require any internet connection to send bulk sms.